Drumming advice...free downloads...drum books/CDs...drum DVDs...at the best prices available. email for details webdrum1@mac.com Both books now available for download on Amazon Kindle. Click here. Drumming advice...free downloads...drum books/CDs...drum DVDs...at the best prices available. email for details webdrum1@mac.com Both books now available for download on Amazon Kindle. Click here. Steve Laffy – professional international drummer, author and drumming coach. Steve has been a professional gigging musician for over 30 years, working in television, radio, theatre and has toured and gigged extensively. He has played with a diversity of artists such as William Bell, Zoot Money, Daniel O´Donnell, Chris Jagger, The Foundations and many others. He has played tours, concerts, clubs and festivals in the UK and overseas including France, Germany, Italy and the rest of Europe, Japan and Mexico. 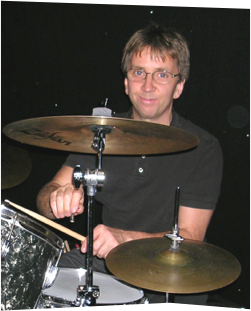 Steve has a diploma in Music Practice from London Trinity College and has achieved Rock School Grade Eight drums. He is also an Associate Lecturer in Music Practice, currently teaches drums at Warwick University. is a member of the Vic Firth Education Team and has published two drum tutorial books and two DVDs. "Since I first began teaching drums, I´ve been looking for a book that explains drum beats, music notation, and counting systems in an uncomplicated way for every beginner to understand. Steve has made it as easy as possible for any beginner to gain a good knowledge of playing the drums and reading music. This book/CD perfectly compliments my style and method of teaching and I highly recommend it for all new players." Ross Elder - Teacher and professional drummer. "Very good, well mapped out, nice and easy to read. Very cool!" Steve Washington - Teacher and drummer for Take That, Texas and many other international acts. "Excellent tutor for beginners & intermediate students. Steve has found a unique way of communicating the importance of musical notation to the student, which will help them overcome the difficulties of rhythmic independence."